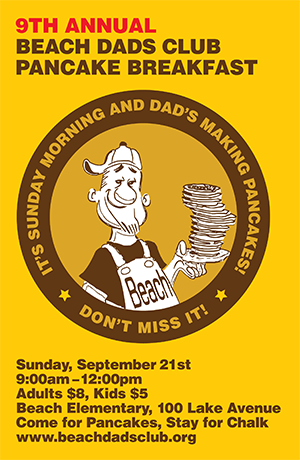 Join the Beach Dads Club on Sunday, September 21, from 9AM–12PM for the 9th annual Pancake Breakfast. Come to the Beach Playground to celebrate the start of the school year, catch up with friends, and enjoy a plate of made-from-scratch (by Dad!) buttermilk, blueberry, chocolate chip, or oatmeal pancakes, plus sausage and bacon, fresh fruit and Peet’s coffee. All prepared by the Beach Dads Club! The Beach Dads Club gratefully thanks our many community supporters: Pancake ingredients are generously donated by Mulberry’s, bacon & sausage from Piedmont Grocery, fresh fruit and orange juice from Montclair’s Village Market and Peet’s Coffee. Tickets can be purchased at the event, $8 for adults and $5 for kids. Proceeds for the event help support Beach Elementary School programs. The Pancake Breakfast will be followed by the Chalk Art Festival sponsored by PAINTS. Kids and adults can purchase chalk and a square on the play yard to decorate and enjoy. The event often draws PIXAR and other local artists and animators, but nothing outdoes the kids’ wonderful drawings. Funds from the Chalk Art festival support art programs in the Piedmont schools. Previous post ← PAINTS Chalk Art Festival!